Additional Info: The Fijian customs have utmost courtesy and dignity toward their visitors. They perform ceremonies for every occasion, which may include the presentation of tabua (whale's teeth), food or other gifts, or more commonly the drinking of yaqona (kava), the national beverage. Fiji occupies an archipelago of about 322 islands, of which 106 are permanently inhabited, and 522 islets. 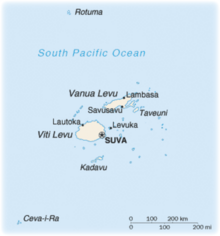 The two major islands, Viti Levu and Vanua Levu, account for 87% of the population. The islands are mountainous, with peaks up to 4,250 ft, and covered with tropical forests. Viti Levu hosts the capital city of Suva, and is home to nearly three quarters of the population. Direct flights are offered from the US, Canada, Australia and New Zealand. Scuba diving in Fiji is a beautiful dream of colors. With its 330 islands surrounded by reefs and the entire spectrum of tropical underwater terrain, Fiji is impossible to sum up with a single image. But from the sharks, rays and 1,000 species of fish to the soft corals, sea stars and myriad shrimp, one word does describe Fiji's extremely diverse diving: color. 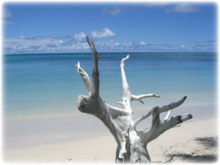 Generally, there are two very distinctive marine environments around Fiji. One is a huge lagoon many thousands of acres in area. The other is found at the Barrier Reef and its passages. Namotu Wall:The stunning Namotu coral cay stands perched on the edge of a 3,300ft plunge into the depths of the Pacific Ocean. Diving here on the outer reef slopes is spectacular. The prolific fish life, the visibility, reef sharks, turtles and schools of Barracuda are all in abundance. The Supermarket: just 6 miles away from the resorts is possibly the world's most famous shark encounter. Grey reef sharks, White tip reef sharks and black tip reef sharks keep the adrenaline pumping. B26 Bomber: An American Bomber airplane crash landed only 1 mile from Beachcomber Island in 85ft of water. Although the airplane is well broken up and strewn across the bottom of the ocean, most parts are still all there. They have been connected by a rope so they are easy to find. Entire wing sections, both engines, tail section, electronics, ammunition, the undercarriage, and in fact, the entire aircraft is on the seabed. A great way to explore Fiji's beautiful coastlines is by sea kayak. There's a lot to see and discover from the exciting passage across Rovodrau Bay and Beqa Passage to the protected waters of Beqa Island with spectacular views of Vitu Levu's mist-shrouded, mountainous interior and palm-fringed coastline. Then there is Malumu Bay, where you can paddle your kayak deep into the cliff-lined interior and visit Lawaqalevu Island, where hundreds of fruit bats cling to the surrounding trees like overripe fruit. Tides permitting, you can paddle to the apparent end of the bay only to continue through a secret mangrove tunnel that leads to the great blue sea. Here, views of Kadavu, more snorkeling, island exploration and peaceful paddling are a great way to spend an afternoon. Expect to pay $150 or so for a guided sea kayak tour for one person for a full day. If you want to spend more than a day of your trip in Fiji in the water, look into some of the longer kayak trips offered.